Need some help making your packing list? Do you know which items you are going to pack for your summer festival weekend? Your personalized festival checklist is perfect to prepare for the weekend and make your weekend a big success. Preparing for the festival weekend will be much more fun, easier, faster. Use the checklist at home, in the shop, and during the festival on your laptop, smartphone, tablet or game console. You can finally view your checklist on your favorite device. Tip: use the email-feature to mail your final packing list to your mailbox so you can access it (almost) anywhere. Tip: make a print-out of your final checklist for situations where you cannot access the Internet or your mailbox. What makes this specific packing list so interesting for you? You always start with the standard packing list. All the items have been carefully selected, and divided in several categories. The camping gear is a separate category. Only mark the items which are relevant for you. Un-mark others you do not care about. So you decide yourself which items end up in your ultimate personalized packing list. Add specific items or notes to your checklist (optional). Congratulations! You have made your own packing list. Save and Email this packing list to your mailbox. This email only contains the items which have selected, and optionally the few extra things that you added. Open this email on your smartphone and you will have your checklist handy at all times! 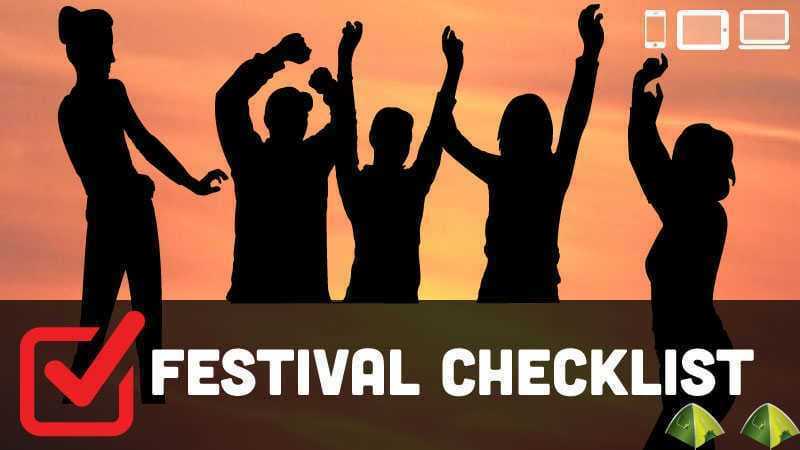 You can also share your custom checklist with friends and family with whom you are going to the festival. How to download your custom packing list in Adobe PDF format? Make your custom packing list as described earlier on this page. Save it to your mailbox. Print the email containing the packing list to the PDF file format. Get ready for your next music festival summer camping weekend.